Crystal clear, crisp printouts are what the HP C 6288 is renowned for. There'll come a time when your HP C6288 will run low on printer ink, and when it finally happens you'll quickly find that replacement HP C6288 ink is typically costly. Thank goodness you have no need to be concerned about dishing out the high asking prices you'll uncover on the main street because right here at Cartridge Save you can pick up all the HP C 6288 cartridges you'll need at seriously low prices. Spend less cash on your ink by shopping online at Cartridge Save! There's little sense in paying so much for the C-6288 original cartridge or C6288 compatible ink down the high street when it's simple to save a ton of cash buying with Cartridge Save. Enjoy complete peace of mind when you buy PhotoSmart C6288 ink cartridges from us seeing as every one is protected by a no quibbles money back guarantee. Be mindful of the fact that each order comes with free delivery, most likely arriving on your doorstep next day! A printer, scanner, and copier in one, the HP Photosmart C6288 is an ideal addition to a home-office set-up, as well as a practical replacement for outdated models. This all-in-one will even support PC-less printing, as it can read a wide variety of memory cards, making photo-printing a breeze. It uses 5 colour inks and 1 black, and boats superior print quality. The HP Photosmart C6288 does not have wireless networking and faxing capabilities, though, neither does it support PictBridge connectivity. The HP Photosmart C6288 boast 64MB of RAM, which speeds up printing, scanning, and copying processes. It also comes in a compact box-type case with the flat bed scanner on top and the control panel lining the front edge. To the left of the controls is a small LCD screen, from which images obtained through the memory card reader can be previewed. The HP Photosmart C6288 uses a total of 6-ink cartridges, with the addition of light cyan and light magenta. One main advantage of using the HP Photosmart C6288 is its ability to support multiple computers, making it an ideal choice for small offices and even households with several PCs. While it is not capable of wireless networking, it supports wired network connectivity. It has a USB slot and 4 memory card slots, supporting a good number of media formats. 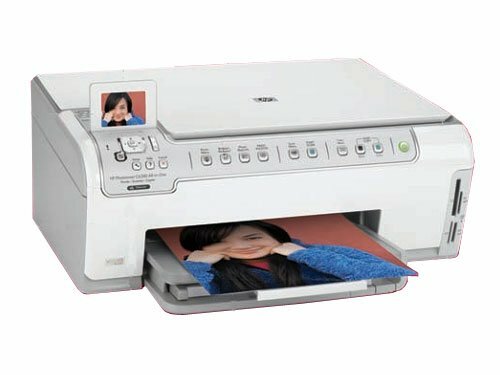 The HP Photosmart C6288 is a reliable device, but it does not have an automatic document feeder, which would have been a good feature. It also does not support PictBridge, which will allow users to print direct from compatible cameras.